Strategy	- The	top strategy is resolve	the root cause. Pamphlet 1 - Striking at the Root with Common Property Rights (8 pages) This pamphlet explains how this solution element resolves the root cause. Read this pamphlet first. It and the next one quickly introduce the concept of Common Property	Rights	better	than	this	page. 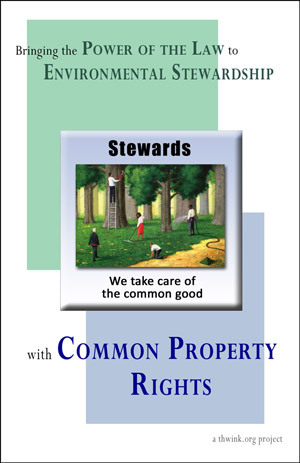 Pamphlet 2 - Bringing the Power of the Law to Environmental Stewardship with Common Property Rights (20 pages) This pamphlet explains what Common Property Rights actually is and how to do a stewardship startup. Our fragile world has a massive property management problem. The world's Private Property Rights System is humming like a top. It's the most efficient system known for managing private property. Corporations and people have all the laws they need to manage private property. But what about common property, like the air we breathe, the water we drink, and all those natural resources we share and depend on? That's being managed poorly. Environmental organizations and activists simply don't have the laws they need to sustainably manage the world's common property. Without the power of the law behind them they can't be good stewards of the planet. They can't take care of the common good. "It is a sad fact that humanity has largely squandered the past 30 years in futile debates and well-intentioned, but half-hearted, responses to the global ecological challenge. We do not have another 30 years to dither. Much will have to change if the ongoing overshoot is not to be followed by collapse during the 21st century." - Limits to Growth: The 30 Year Update, 2004, page xvi. So what might happen if we designed the world's Common Property Right System to be the mirror image of the world's existing Private Property Rights System? 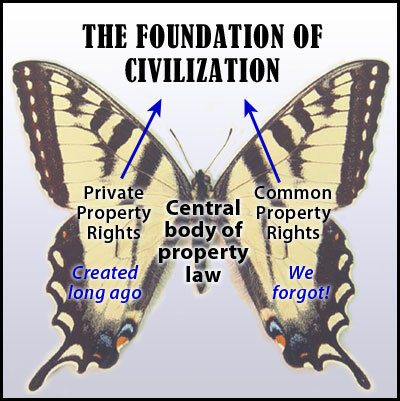 Today the butterfly has only one strong wing: Private Property Rights. That's why society is unable to avoid spiraling down to its doom, just as a butterfly with only one strong wing would. Click on the butterfly to see what civilization with only one strong wing looks like. Click again to see a healthy butterfly. Common Property Rights brings the power of the law to environmental stewardship in the same manner that Private Property Rights brought the power of the law to private property hundreds of years ago. Common Property Rights should have been there all along. But it's not. We forgot. It was left out. The foundation that all the rest of civilization arises from is incomplete. We are now making up for that omission. Once Common Property Rights are there they will be taken for granted just as Private Property Rights already are. And they will work just as well because the two are the left and right wings of the same central body of property law that is the very bedrock of social contract and civilization. Private and Common Property Rights are the twin engines of a productive and a sustainable civilization. Common Property Rights can lead to the reinvention of activism because it's an example of changing the system by resolving the systemic root causes of the problem. No longer are we rearranging the deck chairs on the Titanic by changing one more politician, one more regulation, or one more mind at a time. That approach has failed for over 40 years. As we move into the 21st century it's time to reinvent the way activists breathe and think and work. To do that, all that's needed is the right new tools. The right new tools lead to the right new solutions, such as Common Property Rights. To get the real feel for what we're trying to do see the pamphlet on Bringing the Power of the Law to Environmental Stewardship with Common Property Rights. This describes why Common Property Rights offers qualities no other solutions do and how you can do a stewardship startup. It's a good piece to hand around if you're trying to get others up to speed on the whole idea of Common Property Rights. The great advantage of Common Property Rights over other solutions is it's generic, efficient, and self-replicating. Generic - It applies to all types of environmental problems. Efficient - It's the mirror image of the world's already existing Private Property Rights system, so it promises to be just as supremely efficient. Self-replicating - Once the solution is in place it naturally spreads to include and solve all the world's environmental sustainability problems, including those unknown today. No other conventional solutions offer these qualities, such as pollution taxes, emissions trading, regulations, conservation parks, collective management regimes, and privatization. Common property is the air we breathe, the water we drink, and all sorts of natural resources we depend on. The environmental sustainability problem is essentially a property management problem. How can we manage the world's common property for the long term benefit of all? So far the problem of how to manage common property is unsolved. But the problem was solved long ago for private property. The world's Private Property Management System works so well we take it for granted. It's incredibly efficient and effective because it's been refined by thousands of years of evolution. So why not take what we've learned from how to manage private property and apply it to common property? That's what Common Property Rights does. Common Property Rights is the mirror image of the world's Private Property Rights system. The two systems are identical except for the type of property they manage. How the two systems differ is explained briefly below. Just as Private Property Rights revolve around corporations, Common Property Rights revolve around stewards. For simplicity the property rights of people are omitted. Enabling legislation Enabling legislation The required enabling legislation to create Common Property Rights is passed. This can be simple because it builds on so much existing private property law. Corporations Stewards Non-profit stewardship corporations are formed. Each has the chartered goal of performing a specific service for the good of humanity. Stewards are public servants. Claims Claims Stewards file claims on any unclaimed common properties needing wise stewardship. Claims allow the solution to spread naturally and efficiently, and to eventually solve the entire problem. This is identical to how all land was claimed long ago. Goals Targets After a claim is approved, the government and the steward set the targets for that common property, such as allowable levels of pollution. The objective is to meet the sustainability targets with the lowest fees possible. Prices Fees Stewards charge fees for use of their common property. This is a fee per unit of ecosystem service use, such as one dollar per pound of a pollutant or ten cents per codfish caught. Expenses Buys Fees are spent on buys, as the steward "buys" the health of its common property back. Buys are the expenses of providing a sustainable ecosystem service, such as education, R&D, implementation cost assistance, and cost of monitoring. Monitor results Monitor results Stewards monitor the health of their common property, in order to adjust fees up or down and to adjust how buys are spent. Once the enabling legislation for Common Property Rights is passed, stewards can appear. A steward is a non-profit corporation whose chartered goal is to manage the health of a common environmental property sustainably, such as a pollution problem or a depleted fish stock. We're solving a systemic problem, so let's think in systems thinking terms. The diagram below shows the World's Property Management System and its three main subsystems. On the right is the Common Property Rights (CPR) system. It's actually already there. All seven CPR components shown are there. It's just that only the component at the top, use of common property, is strong. The other six components are weak because the world has no formal CPR system. Here's the full size diagram. The same power of symmetry we encounter so often in nature has been used to tease out the essence of the structure of the problem and solution. There's a reason symmetry in animals and some plants exists so frequently. It allows sharing of a central core of essential body components. To illustrate how the diagram exploits the power of symmetry, click the diagram to show or hide the butterfly. Right now the world's butterfly has only one strong wing. It has a strong PPR system but a terribly weak CPR system. That's why the world is trapped in a downward spiral of global self-destruction, just as a butterfly with only one strong wing would spiral down to its death. The diagram shows the seven components of the CPR System. It's the mirror image of the PPR System. One system manages private property. The other manages common property, which is natural resources and ecosystem services shared in common and needing sustainable management. The CPR system provides this management as efficiently as the PPR system. The reason the full CPR system doesn't exist yet is only legal private property rights currently exist. There's no such thing as property rights for common property. Today the only strong node in the CPR system is the one at the top, use of common property. Once enabling legislation creating CPR is passed, the rest of the CPR system can spring into action. The butterfly can stop its downward spiral because it now has two strong wings. The nations of the world can set sustainability targets. Common property claims and stewardship can begin. Just as all private property was claimed long ago, non-profit stewards (stewardship corporations) can file claims on any unclaimed common property needing sustainable management. Just as corporations use prices and purchases to manage private property, stewards will use fees and buys to manage common property. Just as corporate managers use measurement of results to check profitability, stewards will use monitoring of results to check sustainability and adjust their actions accordingly. This project implements the Common Property Rights (CPR) solution element. Thwink is putting together a team of innovators. We will start looking for places to implement CPR. Just as the world's Private Property Rights System revolves around corporations, Common Property Rights revolves around stewards. 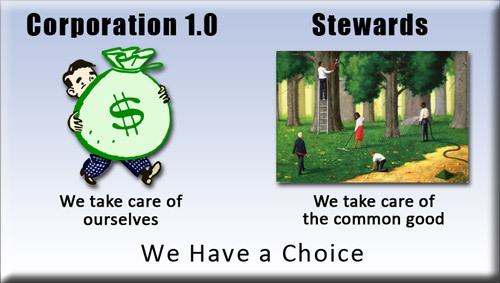 A steward is a non-profit corporation whose chartered goal is the wise stewardship of some ecosystem service. Stewards are much like utilities and fire departments. They provide an essential service to society. Once the world has enough stewards the sustainability problem is solved. Our challenge is to quickly startup as many stewards as possible, get them to the point of self-replication, and then stand back and watch environmental stewards cover the globe. Won't that be a wonderful thing to see? 1. A pocket of low change resistance, such as a county, town, city, or maybe even a state. - Otherwise the all-important enabling legislation will not be passed. The local legislature must be open to the idea of allowing stewards to file claims on unclaimed common properties needing wise stewardship and if the claim is accepted, charge fees per unit of ecosystem service use. The enabling legislation can start small with a pilot project test using non-generic legislation for a single steward for a limited period of time. Later the law can be upgraded to be generic. Stewards and their fees will be a more efficient way to internalize external costs; much better, we think, than straight taxes or trading schemes. 2. An existing well established legal NGO to get the pilot enabling legislation passed and later the full non-generic legislation - Examples are the Southern Environmental Law Center (SELC) and GreenLaw. Using SELC's phrasing, legal NGO's use "the power of the law" to get offenders to behave more sustainably. But that can only solve a small fraction of the total environmental sustainability problem, because the power of the law only applies to existing law. We need so many new laws that what's really needed is a single generic new law that covers all environmental problems. That's what the CPR enabling legislation does and is why CPR should be very appealing to legal NGOs. 3. An existing well established environmental NGO who is already a de facto steward - A perfect example is Upper Chattahoochee Riverkeeper, who takes care of the health of the Chattahoochee River. They are a member of the Waterkeeper Alliance, who has "nearly 200" de facto steward members on six continents. Very few de facto stewards are fully achieving their mission due to lack of the necessary income and favorable law, which is why CPR should be very appealing to environmental NGOs. In the new Congress, we are encountering a severe backlash against essential environmental safeguards. Under the guise of reining in federal spending, anti-environmental forces are attempting to gut the enforcement of federal protections and to put the brakes on EPA just as it was beginning to make real progress on pressing issues, such as regulating global warming pollution and placing strict limits on toxic emissions from burning coal. Big polluters can only be amazed at their sudden good luck. The same thing is happening in several of our states. We will not let these forces get the upper hand. We will initially be looking at startup projects in the US. If you are interested please contact us. 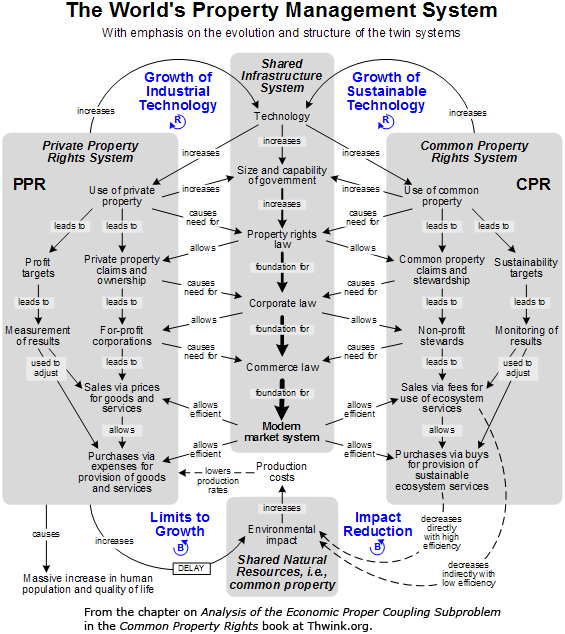 The Common Property Rights book describes how as the number of stewards grows and spreads around the world, that can allow the other solution element described in the book to be implemented. This can lead to resolving all four of the main root causes of the sustainability problem. This project is thus the leading wedge of the entire solution, if things go well. It's an ambitious but necessary project. Our vision is to build the conceptual infrastructure necessary for the Sustainability Revolution and then trigger that revolution by starting the first few stewardship corporations. We can do that by verifying the main conclusions in the Thwink analysis and then implementing the flagship solution element of Common Property Rights. The main conclusions are the root causes of the four subproblems of the sustainability problem. The conceptual infrastructure is the concept of Common Property Rights. Think of it as similar to the concept of modern democracy. Once this ancient concept was re-established in the US in 1788 and France in 1789, there was no stopping the spread of democracy. The concept is described in detail in the Common Property Rights book. The concept will be refined based on the first few actual stewards. We can say the same. The conclusions of our work are not easily accepted. We want to be honest with you. Several years of promoting the results of the Thwink analysis via the website, papers, and contacts has led to nothing. While there have been many interested individuals, we have failed to get an influential organization interested enough to take the ball and run with it. This is no surprise, given the complexity and extreme novelty of the new paradigm. 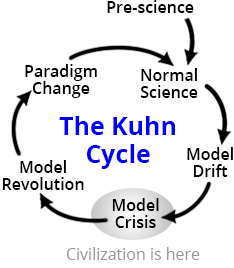 We failed because we ran into the brick wall of paradigm change resistance, just as Thomas Kuhn showed usually occurs when a field finds itself in the Model Crisis step and some of its members are struggling to move the field to the Model Revolution step. of Common Property Rights on a global basis. This is necessarily ambitious. We would essentially be engineering and precipitating the Sustainability Revolution. If we get this project right, that revolution will have as much beneficial impact on society as the Industrial Revolution did. Only this time due to an engineered analytical approach there will be far fewer negative side effects, like the problems of social, economic, and environmental unsustainability, all of which are growing worse with no solution in sight. Strategy 1. Resolve the root cause - The main reason the project has a high likelihood of success is the solution resolves the main root cause of why the economic system is improperly coupled to the environment, and the solution (the first stewards) can begin in pockets of low change resistance. Because of this the solution pushes on a high leverage point. Popular solutions do not. Five successive generations of solutions have helped a little but not nearly enough, because they do not resolve root causes and thus push on low leverage points. This is the central strategy. All problems arise from their root causes. Therefore the only way to solve a difficult problem is to resolve its root causes. Strategy 2. Achieve self-replication of stewards mode - Our main task is to create the necessary infrastructure and then seed it with the first few stewardship corporations. If the root cause of the environmental proper coupling subproblem is correct, once stewards start appearing they will have radically lower transaction costs for managing common property. This will cause more stewards to appear due to proof the solution works, the pent up motivations and frustrations of thousands of environmental NGOs, and the presence of the necessary infrastructure. This will result in a reinforcing feedback loop similar to the one that drove the Industrial Revolution. That revolution was driven by the exponential growth of for-profit corporations. The Sustainability Revolution will be driven by the exponential growth of non-profit stewardship corporations. Strategy 3. Model the Common Property Rights system after similar successful systems - Good revolutionary ones are the Mondragon Coops of Spain and the recent B Corporations movement of the US. There may be more. These systems succeeded due to the correct infrastructure, which established the necessary reinforcing feedback loops so necessary for swift successful growth. Both of these systems have multiple organizations that support crucial needs of member organizations and guide the movement as a whole. For example, the B Corporations movement has B Lab for B Corporation certification and overall movement steering, GIIRS for impact investing ratings, and a Standards Advisory Council. Mondragon has a bank, a university, the Garaia Innovation Park, 14 R&D centers, etc. Of interest is B Corporations require enabling legislation. So do stewardship corporations. The concept of special new Benefit Corporation laws, now approved in 7 states in the US (Usually by unanimous vote!) is seen as the breakthrough concept that has caused B Corporations to appear. As of February 10, 2012 there were 517 B Corporations in 60 industries with total sales of $2.9 billion. The first B Corporation law was passed by Maryland in April 2010. This is evidence that the right pre-conditions will cause rapid growth of a new type of "better for the world" firm. For more see Why B Corps Matter. The reasons are similar to why stewardship corporations matter. While B Corporations are for-profit, the certifier B Labs is non-profit. It's taken a considerable amount of funding to get the movement where it is today. If they can get this amount of funding, so can we. Strategy 4. Put in place a stellar core group - This would steer the project to success. It might become the initial board of directors of the top coordinating organization. Here's an example of how a Common Property Rights startup could happen. There are plenty of potential legal and environmental NGOs who would make good candidates. For example, in Georgia, US we have the Southern Environmental Law Center (SELC) and Upper Chattahoochee Riverkeeper (UCR). SELC is a well established legal NGO covering six states with an annual budget of about $10 million and a staff of 40 attorneys working out of 7 offices. As quoted in the synopsis above SELC has expressed strong pain about change resistance. Upper Chattahoochee Riverkeeper’s (UCR) mission is to advocate and secure the protection and stewardship of the Chattahoochee River, its tributaries and watershed, in order to restore and preserve their ecological health for the people and wildlife that depend on the river system. Established in 1994, Upper Chattahoochee Riverkeeper (UCR) is an environmental advocacy organization with more than 5,000 members dedicated solely to protecting and restoring the Chattahoochee River Basin — drinking water source for 3.5 million people. UCR was the 11th licensed program in the international Waterkeeper Alliance, now close to 200 organizations strong. Clearly UCR is a de facto steward. Many more examples are possible. The important thing is to find good candidates that meet the four key requirements for a successful CPR startup as discussed above. A. Is this an effective solution? This is not an easy question because Common Property Rights is such a novel solution that it's hard to grasp. CPR should be very effective compared to present solutions because it resolves the root cause of improper coupling between the economic and environmental systems. The root cause is high transaction costs for managing common property sustainably as explained the analysis. B. Is there a pocket of low change resistance where the local legislative body would be willing to pass a law giving a test stewardship corporation the temporary power to charge fees to manage the health of a portion of the Chattahoochee watershed? The political unit could be a town, a city, a county, and so on. 1. Get the temporary non-generic enabling legislation passed. It applies only to the test steward for a period of 5 or 10 years or so. 2. Incorporate a stewardship corporation. 3. File a claim using the enabling legislation and get the claim approved. 4. Get fee based stewardship of the river running smoothly. 5. As you go, collect the data demonstrating how well Common Property Rights can or can't work. Improve the mechanism of CPR as you go. 6. If things go well, use experimental results to get the temporary non-generic enabling legislation upgraded to permanent generic legislation. The first time this happens will be the actual birth of Common Property Rights as a generic scalable solution. This would be a historic occasion worth celebrating. 7. More stewards can appear to solve the complete environmental sustainability problem. That's the big picture. Now let's explain in more detail how Common Property Rights would work, taking up after step 7. 8. Enabling	legislation is present. This builds on existing private property rights law. It defines how the components of the Common Property Rights system operate in such a generic matter that all common property is included. We can now generically solve all of the ten unsolved environmental problem identified in the SCOPE study. 9. Plenty of NGOs and individuals in the area have been battling a never ending multitude of environmental problems for years. Without Common Property Rights they have faced a plethora of barriers (high transaction costs) to get problems solved. They have to go to each source of the problem and attempt to bargain with the source to reduce its pollution, consumptions rates, abuse, etc of the ecosystem cycle involved. They may also be going to the government to get them to enforce existing law. They may even be pressing lawsuits to enforce existing laws or lobbying for new laws. They could also be waging local campaigns to get public opinion on their side. This classic activism approach requires large amounts of time and money, however, and does not work reliably. The people involved know this and are frustrated. There are tremendous pent up forces just waiting for a solution like Common Property Rights, because now all these de facto stewards can have the power of the law on their side, as well as a reliable and sufficient income stream. 10. All that pent up frustration and momentum turns into a torrent of stewardship startups. Those wishing to take advantage of the new legal right to be a good steward of the planet form a steward. 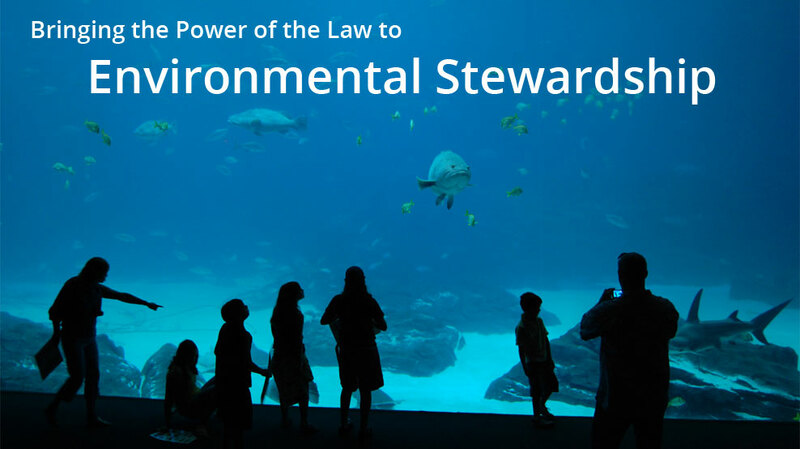 A steward is a non-profit corporation whose chartered goal is to manage the health of a common environmental property sustainably, such as a pollution problem or a depleted fish stock. Incorporation and advisory services are available to make this step affordable, fast, and high quality. A. The common property needs wise stewardship that would benefit society. B. The steward has a credible plan to do this. C. The steward has the means and proper incentives to execute the plan. 12. If the claim is accepted the steward then works with the state to set sustainability targets for the common property. Let's use a polluted river as an example. The sustainability targets would be the acceptable amounts of various pollutants. Or the targets might also be expressed as drinkable, fishable, and swimmable, which would then be translated into specific pollution targets, as well as things like oxygen depletion. The targets would have a safe maximum amount of pollution. 13. Now the steward calculates the fee rate to be charged for each unit of pollution emitted into the river. A fee is the price to purchase a unit of ecosystem service use, such as one pound of nitrogen runoff, one ton of carbon emissions, or 100 pounds of fish harvest. Sources not paying charged fees are guilty of property theft and may be charged with theft under existing property law. Fees are charged at the most efficient places in the system. For a polluted river this might be $1.00 per pound of pollution from measurable point sources like factories. Non-point sources like farms, roads, and homes are tougher to calculate but it can be done. Farms can be inspected to see what chemical and topsoil runoff is expected, given factors like farming methods, ground cover, slope, and buffer zone width. Fee amounts are based on inspection results. Roads can be done in a similar manner. Homes could be done the same way, except runoff per home is probably so small it's not worth charging fees, since the expense of inspection and fee collection would possibly be several times the fee. 14. The fees start coming in. The steward uses the fees for buys, as the system "buys" its health back. Buys are the expenses of providing a sustainable ecosystem service. Examples of buys are measurement of ecosystem health and use rates, R&D for new or improved best practices, cost/share for implementation, education, and awareness campaigns. For a polluted river the steward might offer training to farmers on how to reduce harmful runoff and to factories on the latest best practices for reducing pollution. The steward, working with other stewards around the world, might invest in R&D for new methods of pollution reduction. 15. The important thing is the steward starts the fees low and then raises them until the fees and related buys are enough to reduce river pollution to a sustainable amount. The goal is to meet the sustainability target with the lowest fees possible. 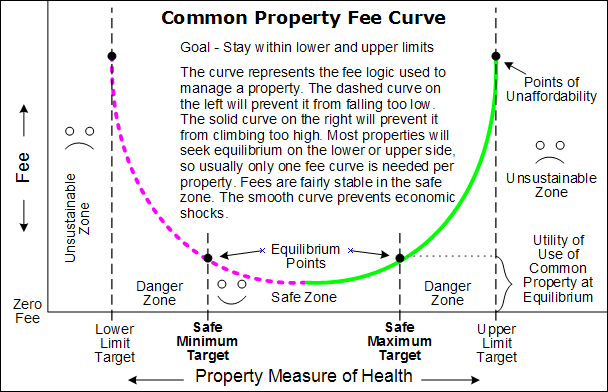 Once the steward figures out what the relationship between fees and common property health is, they can publish a Common Property Fee Curve, as shown. This allows degradation sources to plan ahead and budget in future fees. Common Property Rights is about the simplest possible solution that's also efficient. It's simple because it's the mirror image of private property rights, which is so simple we take it for granted most of the time. It's efficient because the invisible hand of evolution has so refined private property rights that it's become the most efficient method imaginable for managing large amounts of private property. So how can Common Property Rights be any less efficient? This is a discussion page for those working to make this vision happen. For further info please contact us. 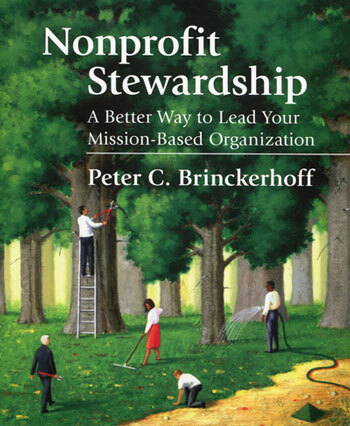 The stewards icon image is from the cover of Nonprofit Stewardship: A Better Way to Lead Your Mission-Based Organization, by Peter Brinckerhoff, 2004. Book publisher is Fieldstone Alliance, an imprint of Turner Publishing. Image used by permission. "The power of the law" is a phrase from the Southeastern Environmental Law Center. Their slogan is "Protecting the South's Environment through the POWER OF THE LAW." The photo at the top of this page and the one on The Magic dropdown were taken at the Atlanta aquarium on June 26, 2007. (1) Regarding "Stewards are part of a carefully thought out solution path for the evolution of the corporate life form. What we have today, Corporation 1.0, is not working." 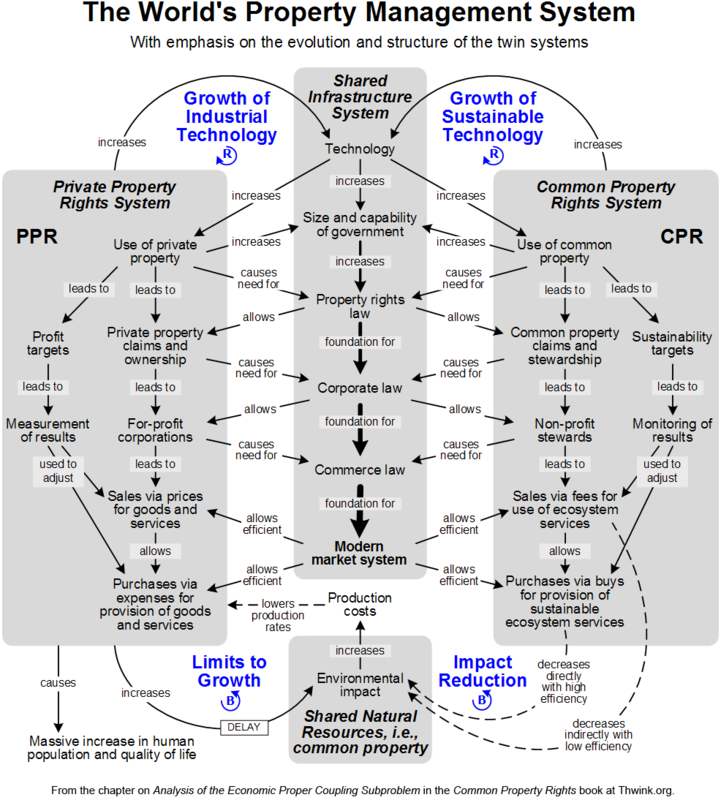 - The analysis in the Common Property Rights book explains how stewards are a first step toward moving from Corporation 1.0 (where we are today) to Corporation 2.0 (where we need to be). A steward is a type of Corporation 2.0.